Ygdrassil Gaming are always hard at work looking to bring the best games they can develop to the market and their latest, Magic Mushroom, looks like another win. Ygdrassil strives to bring new and innovative products to market with great games that offer players unique and exciting challenges. This latest release, which they are understandably proud of, is titled Magic Mushroom and will take players on a wild journey where the altered play style can draw in and challenge players of all skill and experience levels. The first noticeable difference in this slot form the thousands of others that are available for play from so many developers is that the classic rectangular five or three reel design has been tossed out for something entirely new. The five reels in Magic Mushroom are in a diamond shape, each different from the one next to it, being three, four, five, four, and three symbols high and spun in an unchronological order. This means that the reels start and stop spinning not from left to right as we are used to but work their way in with a pattern of left, right, left, right, centre. This is an entirely novel concept that has never been done on a high end online slot machine before. 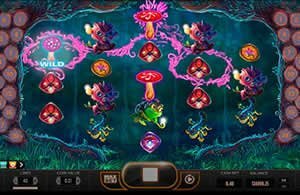 Ygdrassil Gaming's chief executive, Fredrik Elmqvist says, "There are plenty of slots out there based on aliens and zombies but this is the first that uses spreading and multiplying wild Magic Mushrooms. This game is unique in every way, from the reel structure and the characters we've created to the sounds and music we've encapsulated. Players will love it!" He has a full right to be so proud of the final product as all the characters featured in the game were created in clay by hand in the studio before being brought into the game and the engineering for the music, active, and ambient sounds was done by a highly specialized team. Ygdrassil Gaming Limited has an extensive collection of games for players to play and love through their years as a developer of high quality, high end games that often feature amazing progressive prizes. There are well tested and renowned titles such as Jokerized in their portfolio which have been out for some time but never lost their appeal or seemed dated and Winterberries, a fast paced game for players who need to feel the rush of adrenaline when they seek out their slot experiences. They have also seen amazing success with the recently released Fruitoid slot machine which takes users of both the desktop and all touch based mobile devices through new, unknown galaxies across the vast expanse of space. Ygdrassil is a developer that looks to increase their player base in the best way possible, by releasing only the most polished and crisp games they can possibly make.